Crossing Souls is a tribute act that never finds its own voice. What is it? 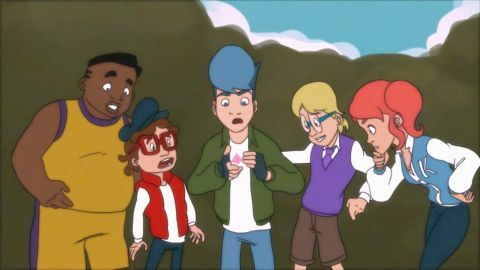 A story-driven adventure game about five kids trying to save the world from supernatural disaster. Crossing Souls is a nostalgic buffet of '80s and '90s favourites. Its story harks back to Stand By Me and The Goonies, its mechanics are borrowed from Streets of Rage and Battletoads, and it's packed with references to Star Wars and Back to the Future. While some of its references are overplayed ("I'm sick of running after everyone. What do you think this is, a role-playing game? "), they're generally harmless, and most times you'll at least crack a knowing smile. As a tribute act, it works. But when it tries out its own material, it loses its voice. It starts with five kids stumbling on a corpse in a Californian forest. On the body is a stone that lets them peer into the afterlife, interacting with any nearby dead souls. Their discovery soon attracts the wrath of all-round bad guy Major Oh Rus, who wants the stone for himself. Soon the group is the only thing that stands between him and the end of civilisation. You'll have to regularly switch between the five characters—as well as between reality and the afterlife—to solve puzzles and defeat various monsters in simple combat. Chris wields a baseball bat that can deflect projectiles, and is the only one that can climb conveniently-placed vine trails. Science nerd Matt has a laser gun and boosters strapped to his shoes to help him clear longer jumps. That's all fine, until you get to Big Joe, who is a clumsy racial stereotype. He's one of three black characters in the game. He wears a full basketball kit, is taller and stronger than any of his peers in combat and his special ability is moving heavy objects. His mother, Jada, had a tough childhood with "barely enough money…[for] clothing and hot water", while the third black character is the leader of a local gang who grew up "in the heart of California's murkiest slum". The group is also criminally dull. Their dialogue is awkward and wordy, as if written by a committee. If you're being generous, you could say the developers were trying make a point about the portrayal of race in '80s media. But tackling that issue requires more nuance than simply copying its problems. There's no extra level of sophistication here, or anything more said on the topic. The group is also criminally dull. Their dialogue is awkward and wordy, as if written by a committee. When they first come across the Duat stone, the most powerful relic in the world, the first thing they say is: "We shouldn't misuse it". Every sentence is similarly sterile and devoid of personality. If you covered up the names on the text boxes you'd struggle to tell which character was talking at any one time. As a result, the plot never got its hooks into me. Aside from one or two vaguely touching moments, Crossing Souls' story can't square its desire to dig into the personal lives of its characters with its need to tell a story about the fate of the world. Some absurd twists in the final few hours meant that I'd lost all interest by the end. It's a shame, because I really like bits of it. It manages to keep the pace up throughout its nine-hour story, throwing you between varied backdrops that all look good through its pixel-y, colourful filter. And while individually its combat, puzzling and platforming are nothing special, it mixes them up enough to stop you getting bored. You'll fight a laser-firing boss in a suburban garden while trying to short-circuit an electric fence, interrogate a barber in an old western town, and use a cipher to decrypt a code to help with a giant chessboard puzzle. In its best moments, it drops you into mini-games that draw on classics in other genres. In one, you dodge missiles in a top-down shoot 'em up, in another you ride your bike from the police in a side-scrolling race, ducking and dodging to avoid barricades and soar over jumps. They're enjoyable vignettes, and it's a shame there aren't more of them. If you fall in love with its art style and you fancy a giant dollop of nostalgia, then it throws enough variety at you to keep you going to the end. But if you're looking for an original story to sink your teeth into, then a muddled plot and dull writing will leave you disappointed.